Jameson, the world’s favourite Irish whiskey, has unveiled its latest programme to inspire and encourage bartenders to broaden their understanding of cocktail making and the unique flavours of Irish whiskey: Jameson Barrel Aged Cocktails. The programme was developed in conjunction with renowned London bartender, Myles Davies, at the recently-opened Hixter Bankside. Central to this collaboration was a 200-litre, Jameson-seasoned barrel that was dismantled and then painstakingly re-assembled by 5th generation Master Cooper, Ger Buckley, into a 15-litre barrel for barrel aging Myles’ cocktail creations. ‘Autumn Leaves’ consists of Jameson Irish Whiskey, sweet vermouth and an apple aperitif from Somerset, which has been aged for several weeks. The maturation process in the Jameson seasoned barrels imparts extra vanilla and wood flavours and creates a more rounded flavour profile, which offers a brand new drinking experience. Autumn Leaves is available now at Hixter Bankside, priced at £9.50. As part of this initiative, two up-and-coming bartenders in London will get the opportunity to take part in the Jameson Barrel Aged Cocktails programme under Myles’ guidance, before launching internationally. Bartenders interested in this project should contact their local Pernod Ricard representative. 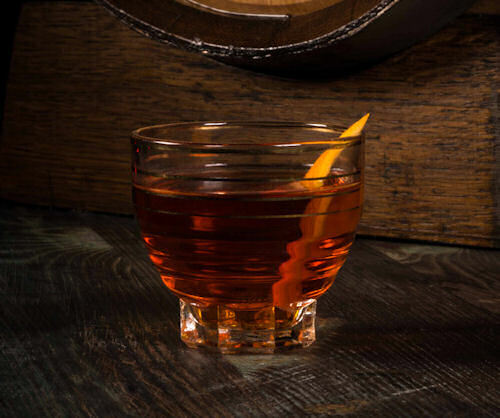 Originally popular in New York in the early 1900s, the practice of barrel ageing cocktails has enjoyed a renaissance in the last five years led by renowned bartenders including Tony Conigliaro. These cocktails are typically aged in the barrel for six to eight weeks to allow the extraction of wood compounds, the evaporation of volatile compounds and the oxidation of cocktail components, which results in a softer, more rounded drink that delivers a fuller characterand a more discerning drinking experience.